The time is now ‘ripe’ to discuss the headway made in extensive work to keep the freshness of fruit, especially mango, from tree to table. What started off as a three-country project, including the Industrial Technology Institute (ITI) in Sri Lanka, to enhance the preservation of fruit, has now expanded to six, with the next goal being the commercial spread of the technology. 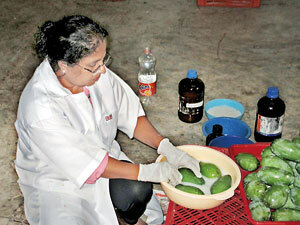 “The technologies that we have developed, in our case for mango and papaya, after experimentation in our laboratories and on a small-scale in the field are now ready to be taken to large-scale commercial viability,” says former Principal Investigator and former Additional Director for Research and Development, Dr. Shanthi Wilson who nurtured the ITI’s project in 2013. The current Principal Investigator and Senior Deputy Director of ITI’s Food Technology Section, Dr. Ilmi G.N. Hewajulige points out that the time is right to scale-up work done in laboratories to the level of commercial use. Having concluded Phase I and into Phase II currently, more than 40 delegates from the six countries will meet tomorrow (May 9) to discuss the project and visit the field to see the technology in action at Embilipitiya. The project’s Phase I – ‘Enhanced preservation of fruits in South Asia’ began with linkages among the University of Guelph in Ontario, Canada, the Tamil Nadu Agricultural University in Coimbatore, India, and the ITI in Colombo, Sri Lanka, in March 2013 and ended in October 2014. The funding was from the Canadian International Food Security Research Fund (CIFSRF) which had as its vision bringing Canadian and developing country researchers together to produce lasting solutions to combat hunger and food insecurity in the developing world. The funding was administered by the International Development Research Centre (IDRC), Canada. Phase II – ‘Enhanced preservation of fruits using nanotechnology’, meanwhile, has seen the country-linkages expanding to cover the Sokoine University in Tanzania, the Nairobi University in Kenya and the University of West Indies in Trinidad and Tobago. It began in December 2014 and is due to conclude in March 2018. The funding is once again from Canada, with the administration by the IDRC. Phases I and II have a heavy gender component to help women gain an income from fruit trees in their home gardens. 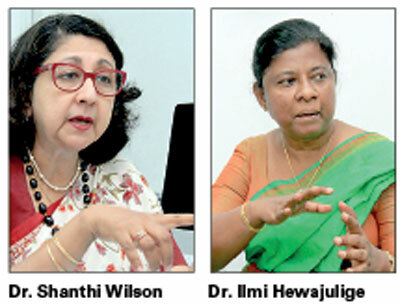 “In Phase II, we have to show the socio-economic impact, get more countries involved and expand outreach,” says Dr. Hewajulige, while Dr. Wilson adds that as ITI has only scientists, they have got the invaluable support of the Centre for Poverty Alleviation (CEPA) to measure the socio-economic impact of this project. Phase I concentrated on the development of technology to reduce post-harvest losses and increase the shelf-life of mangoes. Pointing out that 40 percent of mangoes are destroyed not only due to lack of proper storage and refrigeration facilities but also handling, Dr. Wilson says that they collaborated in the development of hexanal, a natural anti-microbial agent and also nanotechnology for a smart-packaging option to reduce post-harvest losses. The hexanal bio-wax is not injurious to human health and slows the ripening process, prolongs the shelf-life and preserves the freshness of the fruit. The ITI is hoping to commercialise it with Hayleys Agro. Canada’s University of Guelph, meanwhile, has patented a technology using this safe plant-derived chemical compound of hexanal as a post-harvest treatment to extend the storage life of stone fruit such as nectarines, while the Tamil Nadu Agriculture University has developed a nano-film to extend the shelf-life of fruits and vegetables. The nano-particles are developed from agricultural waste with the natural fibres extracted from banana plants. Tests have also been conducted in Sri Lanka and India with pre- and post-harvest applications of the Enhanced Freshness Formulation which is a combination of hexanal and anti-oxidants in spray-form developed by the University of Guelph. 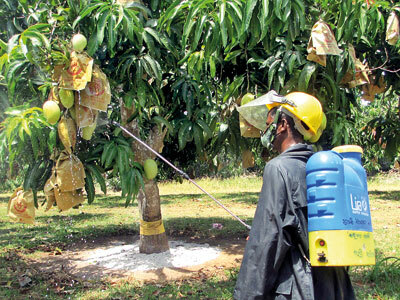 Trials to check the efficacy of the spray have been taken to the field through ITI’s industry partner Suresh Ellawala of Ellawala Horticulture in Dambulla which has an outreach programme with around 500 farmers. These have been a success. If sprayed onto fruit while still on the trees, the mango season which is usually from May to July can be extended by another three-to-four weeks. Otherwise, there is a glut and farmers have to sell off their harvests quickly for a low price. A fibre-board which contains hexanal which has special properties that extend the storage life of fruit has also been developed by ITI and a nano-film (hexanal impregnated electro-spun film) for slow release by the University of Guelph, for which an application seeking a patent has been submitted. India has produced a sachet that contains a nano-fibre matrix of hexanal. The ITI, meanwhile, has developed a fruit-wrap from kehel bada (the pseudo-stem of the banana plant), using the expertise of paper technologist Sunanda Ratwatte. Usually, styrofoam is used as sleeves for the fruit but does not prevent the fruit from rubbing against each other when being transported in boxes, in the wake of which follows damage, faster spoilage and rotting. However, the kehel-bada wrap prevents this, while also absorbing excess moisture. “This is a value-addition to a waste product, because as soon as bananas are harvested, the kehel-bada becomes a pollutant, a large-scale one at that,” says Dr. Wilson. The kehel bada fruit-wrap is now being produced by B. Suyambu of Venture Industries in Embilipitiya who is employing seven women from the area for whom it is a source of income. “The ITI has trained many handlers of fruit and created a knowledge base with regard to post-harvest handling of mango,” adds Dr. Hewajulige. The keynote address at the ‘Progress Review Meeting’ of Phase II — Enhanced preservation of fruits using nanotechnology — tomorrow at the Galle Face Hotel will be delivered by Science and Technology Minister Susil Premajayantha as the chief guest. The Guest-of-Honour is Canadian High Commissioner Shelley Whiting.